Unlike the other parties, the Conservatives have now a 5-year track record on research policy. Their proposed 2011 budget may also be considered as their platform, at least for the short term. Their research policies are de-facto more detailed, hence more open to scrutiny. The Tories’ record is mixed: Continuation of successful federal programs, more government interference in research prioritization and targeted funding, less emphasis on peer-review and the Tri-council, resistance to basic research, new elitist programs, yet major support for colleges. First, you have to give credit to Ministers Gary Goodyear and Tony Clement. Unlike certain Liberal industry ministers before them, they were very engaged – some say too much so (see below) — with the innovation agenda, and were closely involved with most decisions on R&D. Contrary to what was expected and dreaded by Canada’s research community before the Tories got in, the Harper government did not dismantle the marquee programs that Jean Chretien and Paul Martin had introduced. In particular, they maintained the support for the Canada Foundation for Innovation ($750-million for CFI in the 2009 budget), and continued the federal commitment for the Canada Research Chairs (CRC), and the indirect costs for research. The main legacy of the Conservatives vis-à-vis R&D might still be in the hands of the R&D panel of experts they have set up to review the more than one hundred federal programs currently supporting industrial R&D at a cost of $7-billion to government. It was gutsy of the Tories to open that file, and it should be a huge part of their legacy if the panel delivers with substantive reforms, provided of course the government elects to act on such recommendations. What’s good but could have been better! The 2008 budget saw the Harper government introducing the Vanier scholarships for graduate students, in principle a commendable $25-million investment. However, valued at $50,000 annually for three years, these scholarships are almost two and a half times the value of a regular graduate scholarship, hence creating an unfortunate and unjustifiable two-tier system within the graduate student body. The 2009 budget introduced $45-million over five years for “new and prestigious” Banting postdoctoral fellowships. These 140 two-year fellowships valued at $70,000 annually are supposedly designed to “attract top-level talent to Canada”. Again, this investment looks great on the surface. In reality, the “rich” scholarships have triggered unhelpful comparisons with existing postdoctoral salaries and also with compensations of junior assistant professors at colleges and universities. 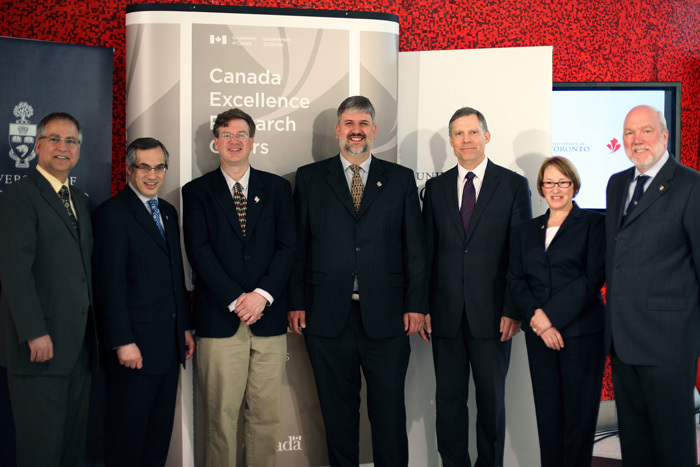 The 2010 budget introduced 20 Canada Excellence Research Chairs (CERC) at a cost of $200-million, which were supplemented by another 10 CERCs at $53.5-million over five years in the 2011 budget. It should be said that these “elitist programs” that involve the very few have not been well received by Canada’s research community. This should be examined in a context where a large number of Canada’s own equally “excellent” researchers are starving for minimal research funding, hence unable to support neither their postdocs at $40K per year, nor their graduate students at $15K per year. What’s behind the Tories preference for “elite programs” could be purely ideological. Conservatives movements normally advocate for individualistic forms of involvement by the best and the few and discourage collectivistic forms of participation. Others say that the Tories may have simply wanted to initiate programs that are clearly distinguishable from those introduced by the Liberals before them. One notable development under the Conservatives is their attempt at involving the colleges in the country’s industrial R&D effort. It started in the 2009 budget with $15-million annually for the College and Community Innovation Program (CCIP), which encourages collaboration between colleges and local industry. Then came the distribution of the $2-billion in Knowledge Infrastructure Program (KIP) funding, which was first supposed to go to scientific research infrastructure at universities. Much of the funding ended up going to smaller, often rural (but hardly research-oriented) community colleges. Funded programs reportedly include a new “café” at Camosun College’s library in Victoria, the Department of Biology in Trinity Western University (TWU), as well as Atlantic Baptist University. Not much research to show for. The 2011 budget was also full of goodies for the colleges, which will receive ongoing funding for 30 new Chairs with a mandate to conduct applied research in fields where “there is an important industrial need.” A further $12 million over 5 years is allocated to NSERC’s Idea to Innovation program that supports joint college-university research in areas of commercialization potential. Moreover, the Industrial Research Assistance Program (IRAP) will receive $80 million in new funding over three years to help small and medium-sized businesses accelerate their adoption of key information and communications technologies through collaborative projects with colleges. Whether this experiment will be successful remains to be seen. The main issue here is whether all this funding could have been more usefully spent on more advanced research at universities and other federal labs. The Tories apparent resistance to support basic research in the last 5 years has probably eclipsed all their well-intended actions within the R&D portfolio. They reportedly consider all individual operating grants normally provided by NSERC, CIHR and SSHRC as “entitlements” and have therefore resisted all calls by the academic and research communities, as well as the AUCC to bolster these vital programs. Consequently, they have shied away from supporting the 3 research granting councils, which are considered by the research community as the sole honest brokers for allocating funds on the basis of merit through peer review. The Tories’ 2009 stimulus budget managed to reduce the funding for the Tri-council by $147.9 million over 3 years, causing a national uproar. Budget 2010 increased funding by just $32 million per year. Budget 2011 proposes an equally modest boost of $37 million; $15 million will go to each of CIHR and NSERC, while SSHRC will receive an increase of $7 million. This represents an increase of just 1.7 per cent for the tri-council, most of it targeted towards “industrial partnerships”. Genome Canada was another loser. It eventually received $75-million in 2010, after funding was omitted in the 2009 budget, to much outcry. Adding insult to injury, the Conservative government often circumvented traditional practices for funding decisions through open competition and peer-review. The 2011 budget provides $45-millions for the Institut National d’Optique, $100-million for the Brain Canada initiative, and another $50-millions for the Perimeter Institute for Theoretical Physics. By hand-selecting recipients like this from among dozens of other –at least equally deserving– research centres and institutes, the government is perceived as politicizing the research funding process by taking it away from the hands of the experts and giving it to politicians. Another controversial point arose when the federal government proceeded in the 2009 budget to earmark the $17.5-million assigned to SSHRC for graduate scholarships towards students in business and finance. Taking a chapter from the Liberals’ book, the Conservative government endowed the Federal Economic Development Agency for Southern Ontario (FedDev Ontario) with $200 million a year, supposedly to help communities that were hard-hit by the recession. FedDev was in the portfolio of Gary Goodyear, Minister of State for Science and Technology, and its support for hard hit centres often came through educational science and technology outreach programs. Again, its funding decisions ($80 million for The Graduate Enterprise Internship, $20 million for The new Youth STEM initiative, etc.,) have been loudly criticized by opposition parties. In the same spirit, the Tories gave the Atlantic Canada Opportunities Agency $19-million annually to extend the Atlantic Innovation Fund, a competitive initiative for academia and industry to develop and commercialize new technologies. These are mostly the decisions that were clearly made for purely ideological reasons and with a disregard to any scientific input. A case in point is the decision by the Conservative government to dedicate no new funding to the Canadian Foundation for Climate and Atmospherics Science (CFCAS), the major funding agency in the country for climate and environmental research. Though the government recently extended CFCAS’s mandate by a year, through March 2012, the Foundation hasn’t received any new government funding since Paul Martin’s Liberal government dedicated $50-million to the Foundation in 2004. Another low point was the –widely reported– interference by the minister in a SSHRC funding decision for a conference at York. Last but not least is the Harper government’s cancellation of the long-form census, which used to provide unrivaled data for decision making by industry and policy-makers, as well as being a major source of information to academics and other research groups across the country. The government’s specious argument that the survey is too intrusive was not substantiated, and the way with which this issue was handled was surely not a glorious moment of the Conservative era in government. As my colleague Rob Annan so eloquently states: “Ignoring the data when crafting policy is unconscionable. Eliminating the data altogether is unforgivable”. The panel is charged with a history making responsibility: strategize the long term investment in research and development in Canada. I hope this panel forcefully defends the need for long term, stable research investments consistently made in consultation with leading experts on the proposed directions through peer review. A couple of comments (as usual!). Elite/elitist programs are employed with a particular rationale–that of developing, recruiting and supporting “human capital” in elite knowledge industries, ultimately with the goal of building a competitive “knowledge economy” in Canada. E.g. the Vanier awards were created with the intention of luring top overseas doctoral students to Canadian universities (indeed, there was apparently some disappointment that the first round of winners were almost all Canadians); altered immigration laws mean it’s also easier for them to stay, and contribute to the Canadian economy, once they’ve completed their PhDs. The CERC funding works the same way, again with overseas recruitment (hence the frustration of Canadian researchers), and the Banting Post-doc awards fall into the same category. The research policies you discuss are also augmented by cuts to research on higher education accessibility and other education issues, reducing the government’s capacity for “evidence-based” policy development. For example, they allowed the Canada Millennium Scholarship Foundation to expire at the end of its 10-year mandate in 2010. While some of the funding provided to students through the CMSF has been replaced by a national grant program, the research it provided (such as the “Price of Knowledge” reports) is no longer being generated anywhere (that I know of); I predict an increased reliance on right-leaning think-tanks. Similarly, the Youth in Transition Survey had its funding cut, ending the only longitudinal survey that showed the progress of multiple cohorts of Canadian university students through their PSE careers and into the workforce. The Canadian Council on Learning, which is self-described in its mandate as “a catalyst for lifelong learning, promoting and supporting evidence-based decisions about learning throughout all stages of life”, lost its federal funding as well. So I think it’s possible that decision-making in other education-related spheres (such as student assistance) will become more politicised at the federal level as well, given that we will lack the research to make informed decisions about it. the colleagues they sit beside, I would hardly call it an elite group. the perception of large inequities in student support has a negative effect.